Geek Lit Etc. : Manga Monday: How bad can a public high school really be? Manga Monday: How bad can a public high school really be? It's not Takashi Kamiyama's fault. It really isn't. He could have gotten into a much better high school if he wanted to. In middle school, Ichiro Yamamoto helped him stand up to the bullies who called him 'pencilneck' and stole his lunch money. So when high school exam time came around, and Yamamoto was discouraged, Kamiyama told him that a good student can learn anywhere, and that he would apply for Cromartie High School, the easiest school to get into, with him. Unfortunately, Yamamoto didn't even get into Cromartie, so now Kamiyama is at a very, very rough school all by himself in Cromartie High School Volume 1. Cromartie is a rather...unique school. To begin with, it's a school for delinquents. Since no good student in their right mind would ever go to Cromartie, it's assumed that you've built up a hard reputation for yourself in middle school. This works to Yamamoto's advantage, since only a boy with the worst reputation ever could afford to seem as weak as Yamamoto does. Since delinquency is to be expected at a school like this, it takes some extremely special circumstances for Cromartie to stand out. Like the 'kid' in Class 3 with a striking resemblance to Freddy Mercury. Or the gorilla in another classroom. 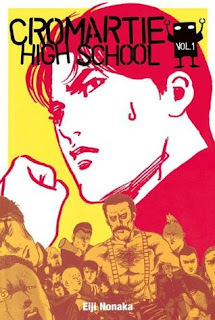 Cromartie High School is a comedy spoofing the popular 'yankii' (juvenile delinquent) manga genre of the 1970s and 1980s. The randomness abounds, the laughs are constant, and by the end, perhaps your own high school experience won't seem so bad after all. Highs: Motion sickness is a terrible disorder that does not need to be made light of. Lows: This isn't a starter manga, as a reader without a good founding in manga tropes would probably be lost. Verdict: Cromartie High School Volume 1 may not be for everyone, but those with the right sense of humor will enjoy it immensely.